TORONTO—Miss World Canada, Anastasia Lin, won’t be in China to compete in the Miss World finals in Sanya City this Friday, but that didn’t stop her from celebrating. Lin was honoured at a reception on Tuesday, Dec. 15, where she spoke to the press about being banned from her birth country and her efforts to raise the plight of Chinese people denied the most basic right—the right to believe. “Chinese people like my father have lived their entire life in fear. They lived through the Tiananmen Square massacre, they lived through the Cultural Revolution, and watched their family and friends be persecuted just because they want to be themselves,” Lin told the crowd. Chinese people like my father have lived their entire life in fear. Lin said consistent repression in China has damaged the national psyche, but despite imprisonment and violence, some have tried to pursue their ideals. “They have tried, but every single time, their dignity gets stripped away. They try again and again until today when they forget what it feels like to have a free mind. They’ve forgotten what it feels like to keep their deeply held convictions. But there are a lot of people who didn’t give in,” she said. Lin has been lauded in editorials in some of the biggest newspapers in Canada and the U.S. for her efforts to raise such issues, but the actress said her story is a small one among many more significant tales. She pointed out Paul Li, who was also at the reception, as one example. Li’s father, Li Xiaobo, was a county magistrate who was sentenced to eight years in prison for exposing the persecution of Falun Gong. He was released in 2012, only to be arrested for the same thing and sentenced to another eight years in April this year. Lin’s efforts have also won her support among a wide range of people, including Clarence Eugene “Butch” Carter, who played for the L.A. Lakers and went on to coach the Toronto Raptors. Carter said he researched Lin and was moved by her tale. “For someone that young to take on this kind of pressure—they need everyone’s support,” said Carter. Lin made international headlines after revealing her father, who lives in China, was threatened by Chinese security forces in an attempt to silence his daughter’s human rights advocacy. Actress and singer Arlene Duncan, who starred as diner owner Fatima on CBC’s “Little Mosque on the Prairie,” said Lin was being forced to pursue her career with the added pressure of pushing back against the Chinese regime. Lin’s story made Duncan and others aware of the threats common to many Chinese Canadians who speak up about abuses in their birth country. Carter said such practices are common in authoritarian countries. Duncan said Lin’s personal tale made this distant reality something more tangible. “It is exposing something that I think we need to be more aware of. Because we are so lucky here, we are so blessed to live in this country,” she said. For filmmaker Leon Lee, one of those hosting Lin’s reception, that reality is all too familiar. Lee won a Peabody award earlier this year for “Human Harvest,” his documentary on forced organ harvesting in China. He is also the director of “Bleeding Edge,” a soon-to-be-released thriller that Lin stars in. Lee has faced consistent interference with his work by the Chinese regime. In one instance, a Los Angeles film festival director was visited by two men from the Chinese consulate who wanted to see what Chinese films were screening. The festival director avoided their effort to pressure him to drop “Human Harvest” by saying it was a Canadian film, in effect suggesting it had nothing to do with the Chinese consulate. Lee said in the case of the festival, the director was ready to go to the press if the consulate pushed to have “Human Harvest” cut from the lineup. Both Lee and that director saw the interference as a story the media would have been interested in. It’s a scenario that Lin has experienced to great effect. 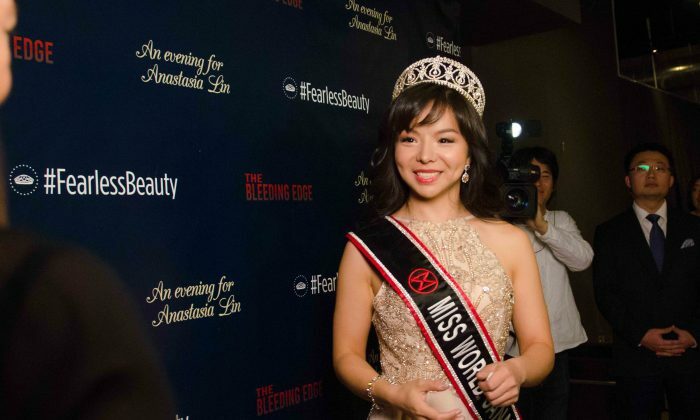 Her reign as Miss World Canada has drawn more media attention than the entire pageant has had in years thanks to Beijing’s efforts to silence her and block her from participating. The Bleeding Edge Official Trailer #1 from Flying Cloud on Vimeo. That media attention has also been a boon to Lee, who has seen his relatively small film get international exposure as a result. Unfortunately for some larger studios, the burgeoning Chinese film market proves too strong an incentive to resist self-censorship. In making ‘Bleeding Edge’ we’ve also experienced all kinds of interference. Some films are altered to take out misdeeds by the Chinese regime (“Red Dawn,” “World War Z”), or glorify the regime (“2012”). Studios like Sony that did put out films with sensitive subjects, such as “Seven Years in Tibet,” have been banned in China, as was the lead actor for that film, Brad Pitt. Lee said he is not surprised major studios are applying self-censorship out of consideration for the Chinese market, but they will have to weigh the costs, including appeasing a regime known for butchering its own people. “It is ultimately a choice of whether you stick with your own conscience and business ethics or whether you go in pursuit of profit regardless of whatever happened [in China],” he said.